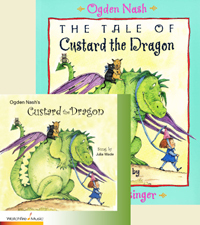 Ogden Nash’s delightful classic children’s poem, Custard The Dragon, has been most cleverly set to music by NY and WFM composer, Brad Ross. The CD receives a smashing performance by vocalist, Julia Wade and is produced by Peter Link. The book, beautifully illustrated by Lynn Munsinger and published by Little, Brown And Company, has been a children’s best seller for over a decade and completes a great gift item. Don’t let your child grow up without experiencing this classic tale.